The Washington Health Insurance Exchange recently released proposed health plans and rates for 2015. According to the Washington State Insurance Commissioner's Office, 17 health insurers filed more than 230 individual health plans for 2015, to be offered both inside and outside the state-based Health Insurance Exchange, Washington Healthplanfinder. 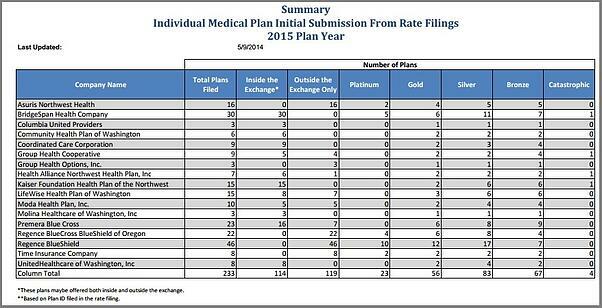 Twelve insurers filed 114 individual health plans for sale inside the Exchange. If approved, the number of Exchange plans would increase from 46 to 114. Currently, eight insurers offer individual health plans inside the Exchange. Specific plan and rates can be found at the Commissioner's rate review database at www.insurance.wa.gov. The plans, provider networks, and rates are currently under a review process and will be finalized by early fall. Open enrollment for coverage in 2015 starts November 15, 2014. See: Timeline for 2015 Health Insurance Marketplace Plans and Rates.